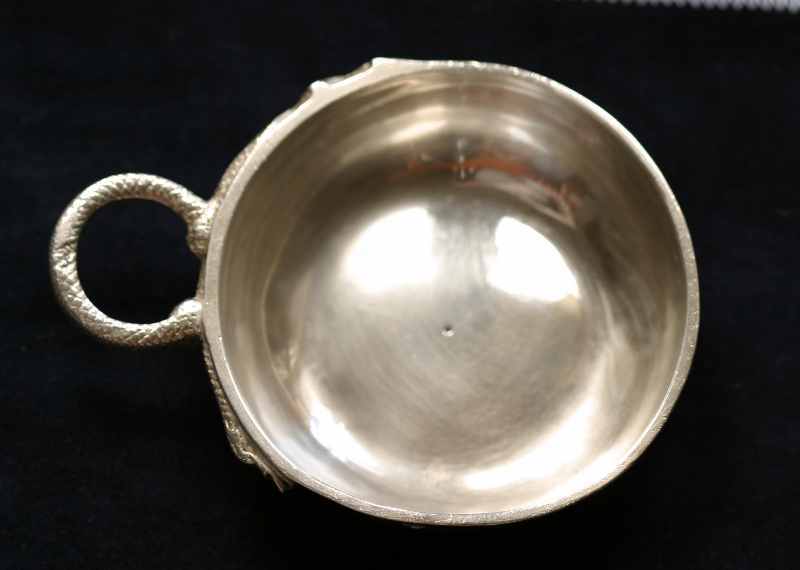 In this article, I present two silver wine tasters by Jacques Famechon, who was admitted as a master silversmith in Paris on March 15, 1770 and was still active in 1787. A wine taster, as its name implies, is for tasting wine and for observing its color, and several types existed in the 18th century in France, each one corresponding to a particular wine-making region. 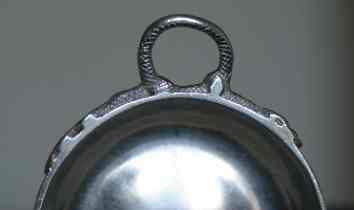 The types vary according to the form of the handle and the presence or absence of decorative motifs. One can find wine tasters with a handle in the form of a snake, with a rolled handle, with a thumb-rest, with a shell- or lily-shaped handle or with no handle at all. A variant of the wine-taster is the so called hunting cup, which is very rare and much sought after. 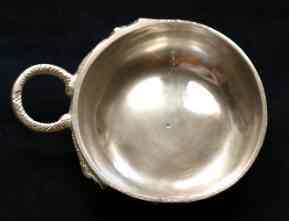 These types also varied according to their size, the smallest being used for spirits, medium-sized ones for wine and the largest for cider. 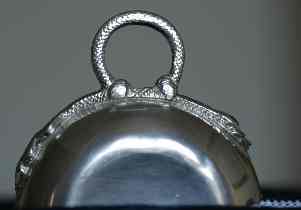 The type with the snake-shaped handle, which is presented in this article, is among the most common. It originated in Burgundy, but examples can be found elsewhere, such as in Auvergne, Berry and even in Paris. The handle is in the form of a snake, an amphisbaena (a kind of snake supposed to have a head at either end of its body) or even two snakes that meet in the middle, either mouth to mouth or separated by a grape seed. The snakes’ body can be smooth or covered with scales. 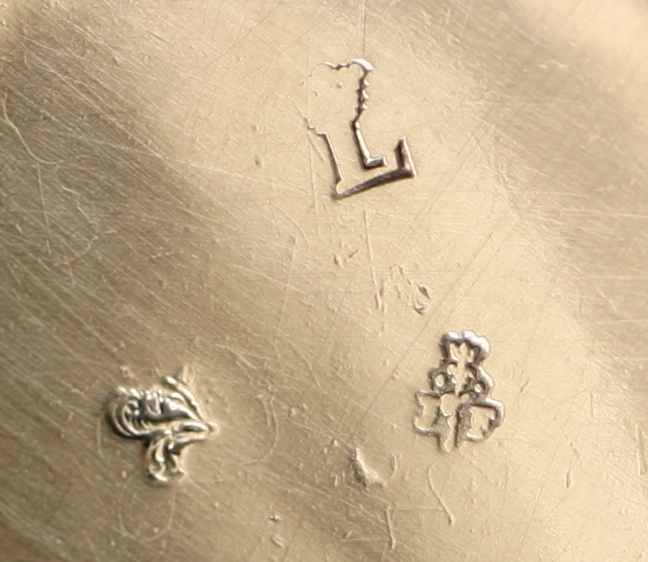 Even before examining the punch marks on the two wine tasters presented here, which allow us to date these objects and identify the maker, we can see that they have various things in common that allow us to suppose that they are the work of the same silversmith. 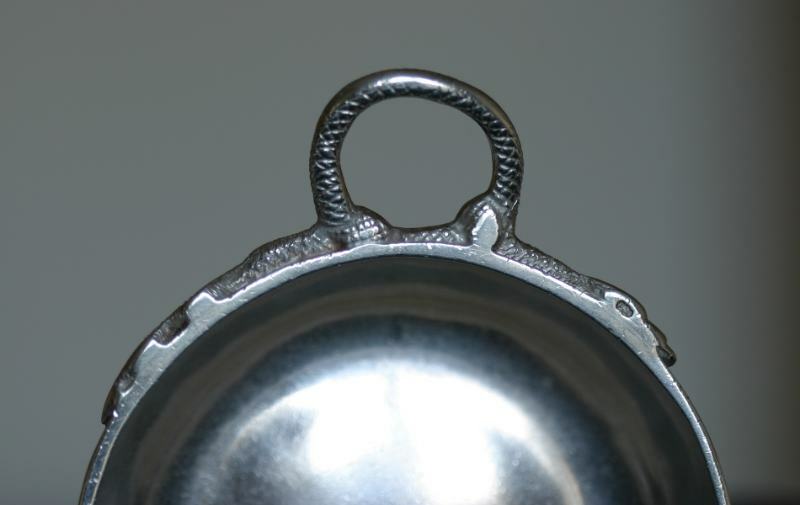 In both cases, the handle is in the form of a snake, which is added and soldered to the cup. The snake’s body is covered with scales and forms a horizontal loop, which can be grabbed between thumb and forefinger. The undulation of the tail suggests movement. 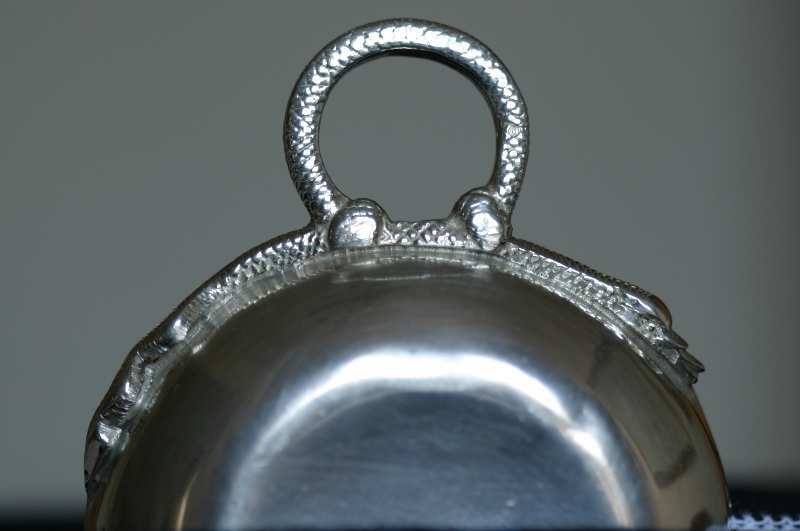 When viewed from above, one of the wine tasters has the snake’s head on the right, the other on the left. 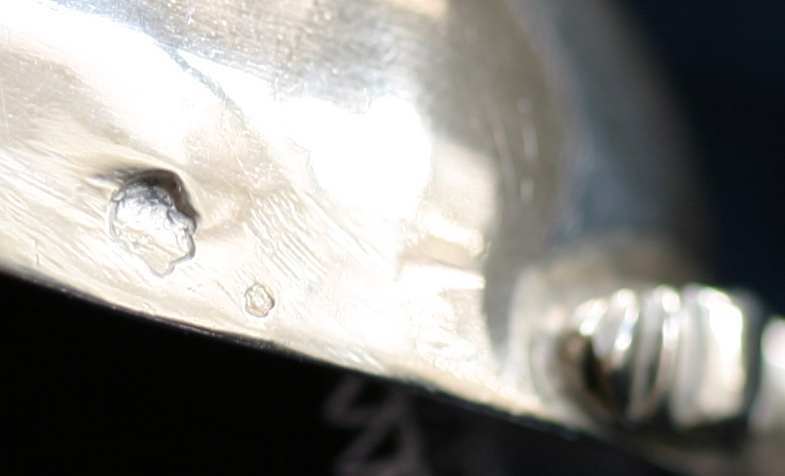 One also notices that the cup, which sits directly on its base, is very thick and rather heavy. Unlike the snake’s body, it is smooth and without decoration. Engraved on one of the wine tasters presented here is the name "CHARLE DEHAIS," who was no doubt one of the previous owners if not the original owner. 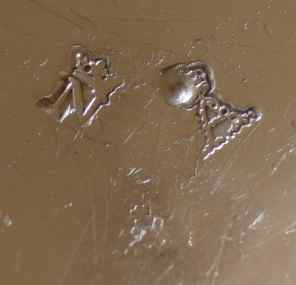 The charge, warranty and maker’s marks on these two wine tasters are found on the base, while the discharge mark, which attests the payment of the tax, is on the edge of the cup near the snake’s head. 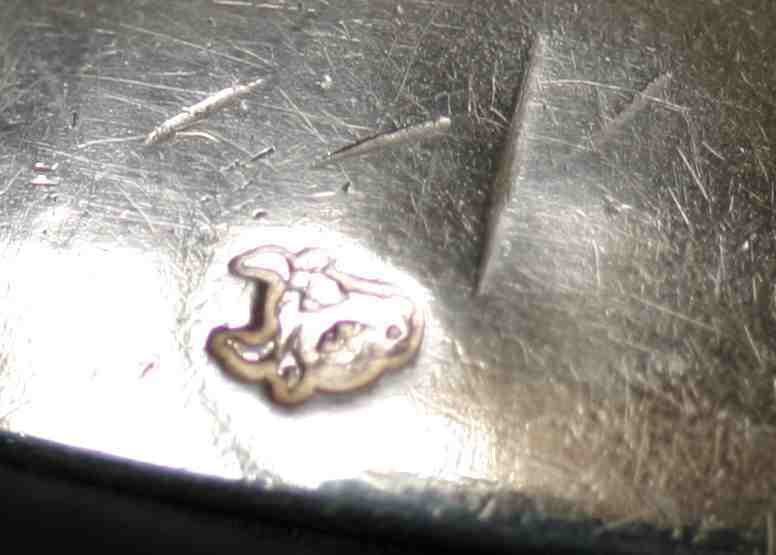 The choice of the location of the discharge mark had a practical purpose, of course, since it was intended to discourage grafting, but it probably also had an artistic purpose, since the snake seems to be watching the punch mark, as if it were lying in wait for prey, ready to bite anyone who would dare try to remove it. The duty and warranty marks on these two wine tasters allow us to date them within a few months or years. 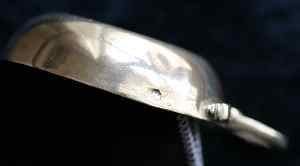 On the smaller of the two, which is also the older, we can see the duty marks for large works of silver in use from October 1, 1768 to November 17, 1774 (crowned letter A for the charge and woman's head for the discharge) and the warranty mark in use from July 16, 1774 to July 14, 1775 (crowned letter L). We know, therefore, that this work was completed between July 16 and November 17, 1774. 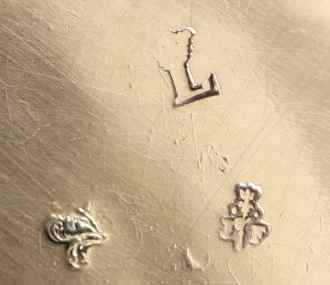 The maker’s mark is very visible and, therefore, easy to identify as that of Jacques Famechon. 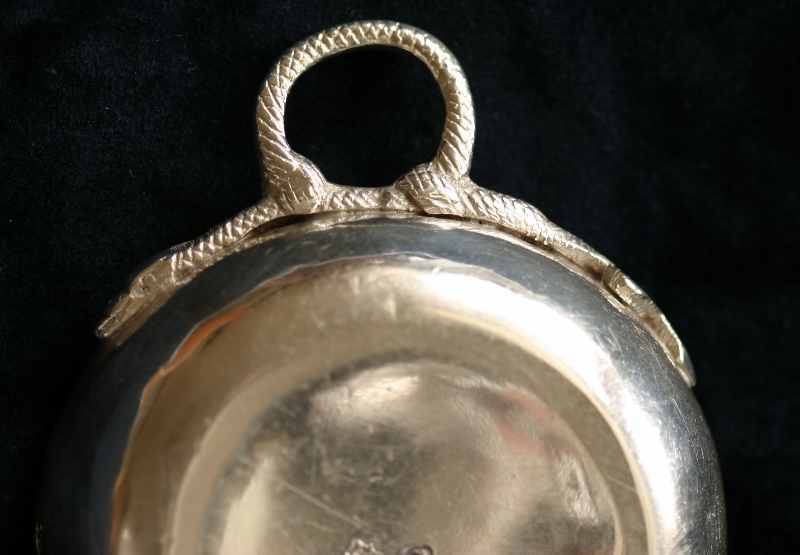 On the other wine taster, we can see the duty marks for large works of silver in use from November 18, 1774 to July 12, 1780 (crowned letter A for the charge and bull’s head for the discharge) and the warranty mark in use from July 13, 1776 to August 12, 1777 (crowned letter N). 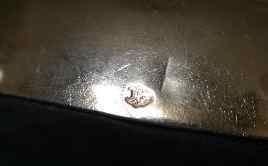 We know, therefore, that the warranty mark was applied between the latter two dates. The work was probably completed shortly thereafter. 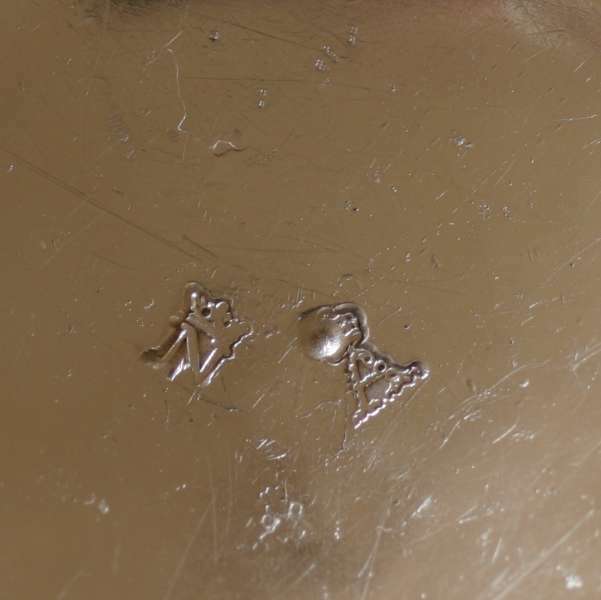 The maker’s mark on this wine taster is only partially visible, but, by examining it with a loupe and comparing it to the one on the other wine taster, we can tell that it is indeed the same mark.